According to the government fuel economy website, the 2014 BMW 328d rear wheel drive sedan will offer 32 miles per gallon around town, 37 combined and a whopping 45 miles per gallon on the highway. Buyers who prefer the comforts of all wheel drive and opt for the 2014 328d xDrive sedan won’t have to sacrifice much as those models will still yield numbers of 31 in the city, 35 combined and 43 on the highway. The 328d will also be available in a sport wagon configuration but seemingly only with the xDrive all wheel drive system and the roomier diesel powered 3-Series will offer the same fuel economy figures as the all wheel drive sedan (according to the EPA, of course). In running a quick search on the EPA’s fuel economy website for luxury cars in 2013, the 2014 BMW 328d sedan offers better fuel economy in every category compared to any other luxury car that is powered by a combustion engine of any kind. In other words, shy of the Tesla Model S that is all electric, no other luxury sedan sold in America offers better fuel economy than the 328d…even when equipped with all wheel drive. The most efficient luxury sedan for the 2013 model year is the Lexus GS450h (hybrid) that achieves 29mpg in the city, 34 on the highway and 31 combined so compared to that model, the 328d is better in every category regardless of whether the buyer picks rear wheel drive or all wheel drive. When you “step down” to the EPA website’s Upscale Sedan segment (again, for 2013 since the 2014 list isnt complete), the 2014 BMW 328d still ranks towards the top of the list – sitting behind only the Lincoln MKZ Hybrid, the Lexus CT200h, the Lexus ES300h and the Acura ILX Hybrid in city and combined fuel economy. The 328d rear wheel drive sedan offers equal fuel economy to the Lincoln MKZ Hybrid while besting the rest on this short list. For comparison, the 2013 BMW ActiveHybrid 3 is found in the Upscale Sedan list on the EPA website and with numbers of 25 city, 33 highway and 28 combined – the new diesel 3 Series is even vastly more efficient than the hybrid 3 Series. 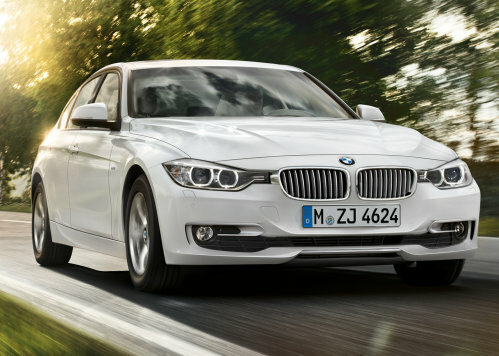 The 2014 BMW 328d is clearly one of the most fuel efficient luxury or upscale sedans sold in America but even if you compare the oil burning Bimmer to the most efficient cars sold in the US – only the top hybrids are able to boast better MPG figures. The most fuel efficient cars in America fall into the EPA lists for “Small Cars” and “Family Sedans” with the bestselling hybrids in country topping both of these lists. Hybrids like the Toyota Prius, the Toyota Prius C, the Ford CMax, the Honda Civic Hybrid, the Honda CR-Z, the Volkswagen Jetta Hybrid, the Ford Fusion Hybrid, the Hyundai Sonata Hybrid, the Kia Optima Hybrid, the Toyota Camry Hybrid and the Honda Insight all post better figures than the 328d but in terms of non-hybrids, there are few vehicles sold in the US that rival the fuel economy figures of the 328d sedan or sport wagon. The only non-hybrid small car in American that can compete with the MPG ratings of the 2014 BMW 328d is the Scion iQ which also offers 37mpg combined but with just 37mpg on the highway, the Scion falls well short of the BMW on the open road. The iQ would probably almost fit inside of the 328d wagon and there is something to be said about not driving a car that would fit in the trunk of another. The iQ is a great little car but it is just that – a (Very) little car. In terms of highway fuel economy, only the Prius C and the Jetta Hybrid offer better than 45mpg in the small car class so other than those two – every compact car in America gets worse fuel economy than the diesel powered BMW 3 Series and that is a pretty impressive feature in the German automaker’s cap.